Publication History: Reformatted in 2013, but the orginal 1991 text was not changed. This is an ISU Outdoor Program/C.W. HOG paper published by the Idaho State University Outdoor Program, Pocatello, Idaho in 1991. Background work for this paper was supported by Federal Grant #G008745372 from the Department of Education, Rehabilitation Services Administration. Reproduction Information: If reproducing some or all of the following paper, we ask that you provide appropriate credit to the author and publisher. Editor's Note: Since this paper was authored in 1991, the figures included in the "Values of Recreational Activities" tables are, of course, dated. The paper also dates itself in the section entitled "Computerizing Records" by referring to LOTUS 1-2-3. LOTUS 1-2-3, a spreadsheet program, was hugely popular in the mid 1980's, but has since been discontinued. Despite these drawbacks, the process of conducting a cost-benefit analysis which is described in the bulk of the paper is still very much current and is still a very useful tool for assessing recreational programs. At first, a cost benefit analysis sounds like some arcane procedure that has no relevancy to disabled programs. From a closer look, however, a cost benefit analysis deals with program costs and efficiency. Since the dollars to run disabled programs are hard to come by, it makes sense to assure oneself that the budget is being spent efficiently. Moreover, those who provide funds to your program have more than a passing interest in cost efficiency. A cost benefit analysis is a type of tool that can help you evaluate budgets. It has other uses, as well, and in particular, it can be used to help quantify the benefits that your program provides. There are different ways of conducting cost benefit analyses. Many of them are highly complex. The type of analysis described within this paper, however, is an fairly simple approach that can be undertaken without much additional time commitment on the part of service providers. It is likely that much of the data needed is already being collected by program staff. Even if one does not regularly do a cost benefit analysis, the material presented here will help program staff develop systematic methods of collecting and recording data. To do a cost benefit analysis, you'll need to start with two basic pieces of information. The first is the number of participants that your program serves in each activity, and the second is the amount of time participants spend involved in each activity. Lets say you provide adaptive swimming for program participants. A swimming session may be one hour long. Record that along with the number of participants each time they meet. Other activities may last longer. For activities that last 8 hours, but not overnight, record the length of the activity as one day. For multi-day trips, record the number of days on the trip. Thus, a weekend trip leaving Saturday morning and returning Sunday evening is two days long. From the number of participants and the duration of the activity, a practical unit of measure, the participant-hour or participant-day, can be easily derived. A participant-hour is one individual involved in an activity for one hour. It is easily calculated by taking the number of participants and multiplying it by the duration of the activity. As an example, a group of 5 participants go on an afternoon canoe trip. The trip lasts from 1:00 PM to 5:00 PM (4 hours in duration). The number of participant hours is 5 participants x 4 hours = 20 participant-hours. At the end of the year, add up the total participants, participant-hours and participant-days for each activity offered by the program. It is helpful to break down the activity categories into a system similar to the categories shown in the tables at the end of this paper. This division between activities makes a cost benefit analysis easier to conduct as well as providing program managers with a more complete information on what aspects of the program are most popular. Without collecting any additional data, several pieces of information are now available, including the number of trips and events offered in each activity category, the amount of time involved by participants in each activity and the total number of activities offered. Program benefits are based on the value of services provided. In an disabled recreation program, the value of a particular service is the amount of money that an individual is willing to pay for a comparable commercial service. The tables at the end of this paper lists the values of indoor and outdoor recreational activities utilized by disabled programs. It was prepared by averaging the prices of a national sample of athletic clubs, ski schools and other commercial recreation service providers. Note that the activities are grouped according to whether they take place on an hourly, a day or multi-day basis. This breakdown was determined largely by how the activity is commonly packaged in the market place. For instance, rafting excursions are typically one day or multi-day affairs. Few rafting trips go for less than a day since getting to river, blowing up boats, running the river, having lunch, and deflating boats and packing boats normally takes a day to undertake. Because of this, you'll notice that the "Table of Values" does not include an hourly value for rafting. You may find that the table does not list all the activities offered by your program. It does, however, include an average value for indoor activities and outdoor activities (by hour, day or multi-day). For any activity which you offer but not included on the table, use the average value. For instance, if you offer one hour of bowling, use the average indoor activity of $9.66 per hour. In addition, you can factor in other benefits. 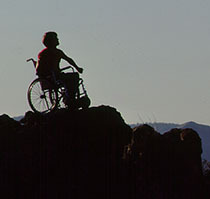 Disabled programs spend a considerable amount of time fund raising. Total income derived from fund raising is a benefit of the program and, if desired, can be added to the benefit figure. Additionally, disabled programs typically utilized volunteers. During the course of the year, record the number of volunteer hours on the master data sheet. At the end of the year, tally up the total number of volunteers hours and multiple it times the minimum wage. This will give you the value of services provided by volunteers. The sum of all these figures equals the total benefits of the program. The last part of the cost benefit analysis is the cost of the program. That's easy. The cost is the total operating budget of the program. What the benefit/cost ratio indicates is the amount of return per dollar of operating expense. In the above example, every dollar invested by the program returns $1.02 in benefits. The Corps of Engineers uses a benefit/cost analysis in determining the value of public works projects. If the B/C ratio is over 1.0, the project is considered prudent use of public funds. Many programs may not achieve a 1.0 or greater benefit/cost ratio. That's understandable, since a recreation program is far more labor intensive when compared to comparable commercial services. Done from year to year, however, the benefits/cost ratio does provide objective data on fiscal efficiency. If the ratio takes a sudden drop, it might indicate problem with the program's finances and a more thorough budget evaluation would be in order. When used by itself, the benefits figure can be valuable in justifying the program to potential donors or granting sources. Describing the benefits in terms of dollar amounts provides a new way for people view disabled recreation. In particular, business and industrial philanthropical interests are absorbed in world defined in terms of dollars and readily relate to such figures. At the very least, it's another piece of data that helps build your credibility. To say that your program generates $75,000 in recreational benefits to disable participants or that volunteers provide $15,000 worth of time to your program helps paint an understandable picture of an worthwhile endeavor. Much of the routine work can be taken out of keeping records by using a computer. For the type of participant record keeping described in this chapter, a spread sheet software program, such as Lotus, Excel or others are extremely useful. With such programs a master data sheet can be designed using the same format as shown in the sample spread sheets described earlier in the chapter. Include on the spread sheet columns for numbers of disabled participants, able-bodied supporters who attend fun raiser or participate in trips and volunteers who help in with the program. On the last column of the sheet, include a code that identifies the activity type A sample code might be RF2 (used in an example above) which stands for rafting, multi-day trips. Make the codes compatable with the activity categories listed the Table of Values. With this information, all the entries on the master data sheet can easily be sorted by the computer software into code categories, and you'll be ready to calculate the benefits/cost ratio without resorting to adding a lot of columns with a calculator. Based on surveys conducted by R. Watters from 1989 through 1991. Numbers represent the average market price of commercially available recreational activities. Final values were derived by eliminating the high and low market values and averaging the rest. Table 2: Outdoor Recreational Activities lasting in excess of one day. Table 4: Outdoor Recreational Activities lasting less than 8 hours.